Winter will be arriving in just a few days. 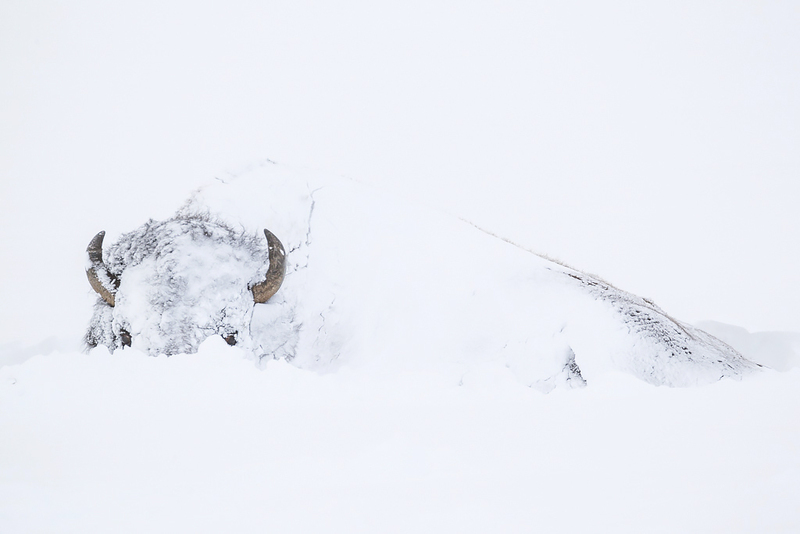 Many photographers living in harsh northern latitudes put their cameras away till spring. That’s a shame since your missing out on some of the most dramatic and beautiful conditions of year for nature and wildlife photography. Preparation is the key to being able to get out and photograph in challenging conditions. Dressing properly will make the experience comfortable and enjoyable. 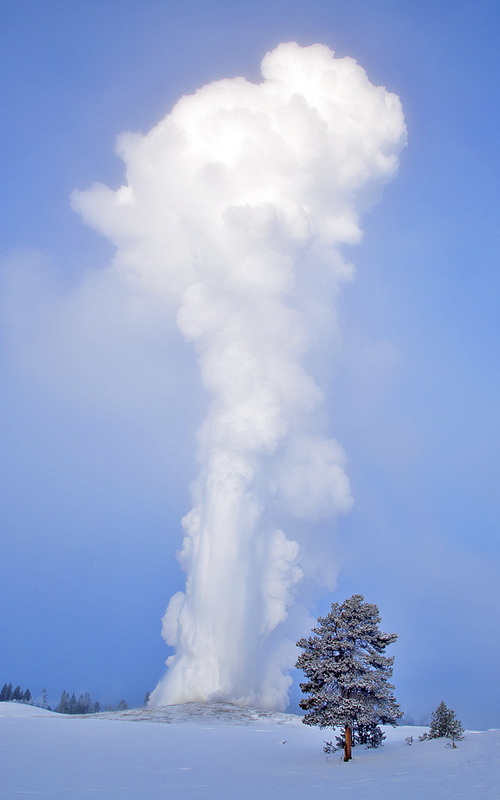 I lead several photo tours each winter into Yellowstone National Park. 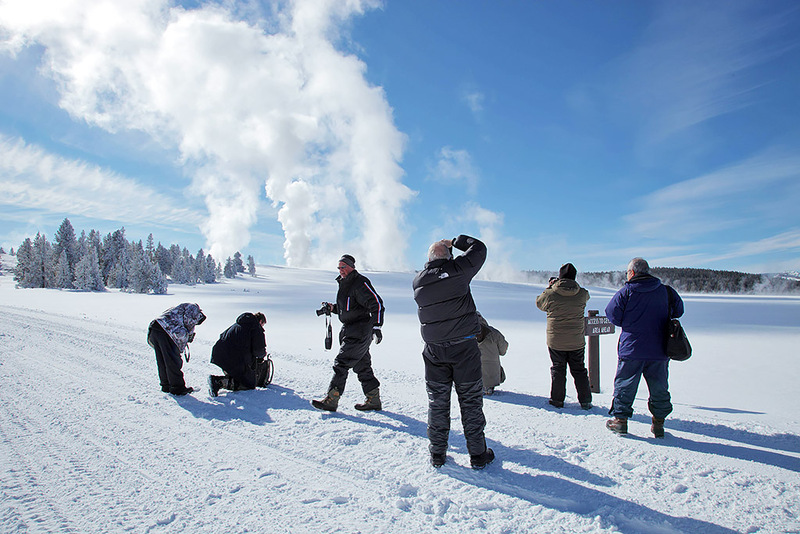 We’ve faced temperatures as low as 42 degrees below zero during the tours but have been able to photography successfully. Dressing in layers is key. I always sent out a suggested clothing list for my tour participants stressing that. You first need a good base layer. There are many great options out there these days from light to heavyweight. Over that a mid-layer of some sort of synthetic fleece (polarfleece) is a good option. Fleece pants and jackets would be perfect. Good wool pants work well also. A goose down jacket and some sort of insulated wind pants finish things off. Ski pants or bibs over your base layer is also a great option. Nothing can make you more uncomfortable than cold feet. A good pair of warm boots is vital. Felt pak options from Sorrel and Baffin work great. Look for boots with a minimum rating of -40 degrees F or lower. I like a good synthetic liner sock covered by a quality heavyweight wool sock. Chemical toe warmers are very nice as well. They can provide heat for hours keeping your toes toasty! Seventy percent of your body heat is lost through your head so it’s imperative to have a warm hat. There are endless styles and options out there. They can be made of wool, synthetic fleece, fur, even down. Don’t skimp here. Nothing is more problematic for winter photography than cold hands. It’s necessary to be able to work your camera controls so heavyweight mittens don’t work. Over the years I’ve tried nearly every combination of gloves, mittens available but have yet to find a perfect solution. The method I currently use is to first have a thin liner glove covered by a rather form fitting mid weight glove made of a quality synthetic material There are many options available. In real cold weather when handling cold cameras and tripods your hands will not stay warm for long. I place a chemical hand warmers in my pockets. Good quality ones will last 10-12 hours. Any time I’m not using my hands I reach into my pockets grabbing the hand-warmers. This warms my hands fairly quickly allowing me to keep working effectively. You must also give consideration to you cameras and lenses to operate properly in the inclement conditions. Cold conditions reduce the cameras battery life. It’s important to have extra batteries on hand at all times. I carry my extra batteries in a pocket close to my body. Body heat helps keeps the battery at full power. Waterproof lens and camera covers may be necessary during time of blowing and falling snow. You can purchase custom made varieties for your camera and lens combination or just use a plastic trash bag. Taking your camera and lens into a warm space after being out in the cold for a while will cause condensation in your camera in on the internal elements of your lens. You don’t want this to happen. Seal your equipment in an airtight plastic bag before taking them into a warm space. I’ve found that just taking them into the vehicle and allowing them to warm slowly seldom presents a problem. 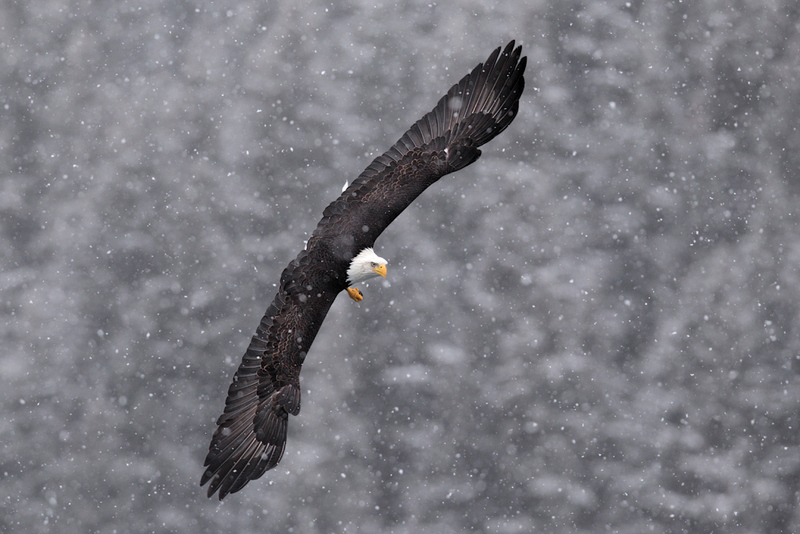 I just love photographing wildlife in the snow. Falling and blowing snow conditions are my favorite. It adds a sense of drama to the image and portrays the struggle wildlife must endure to survive. There are some techincal realities you must keep in mind to capture properly exposed and focused winter images. The very light overall tonalities of many of your winter images will cause the camera to consistently underexpose your photographs. 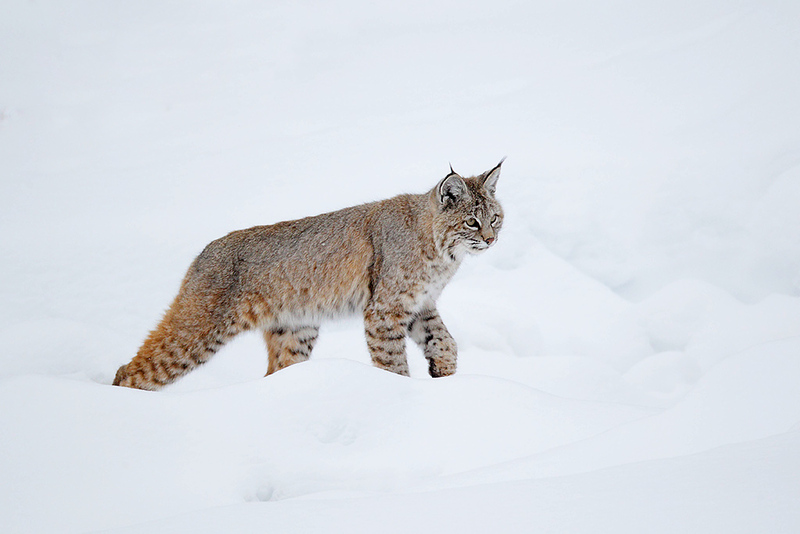 In the photo of the bobcat above the overall scene is nearly white. My camera was set on auto exposure. I had to override the cameras chosen exposure by adding 1.6 stops of light with my exposure compensation feature on my Canon camera. The lower the light levels the more plus compensation is required. 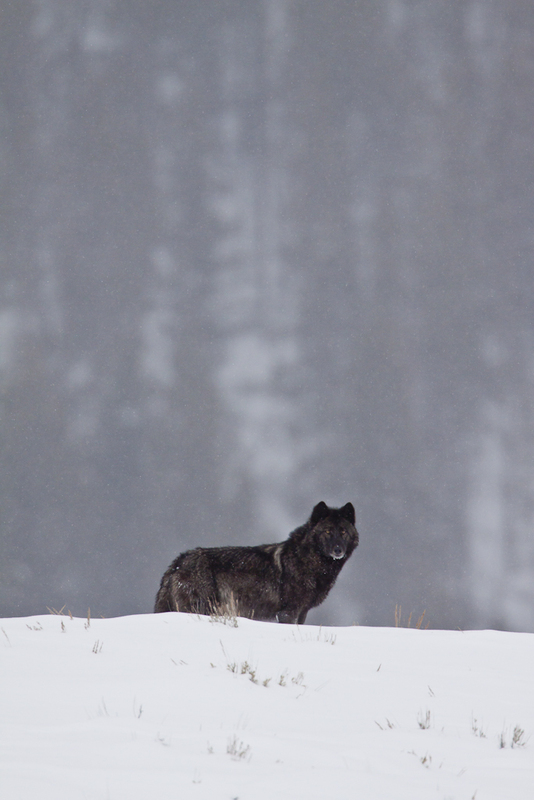 Snow was falling when I captured this image of a black wolf in Yellowstone National Park during one of my winter tours a few years back. The overall scene is here is affected by the dark forest background. 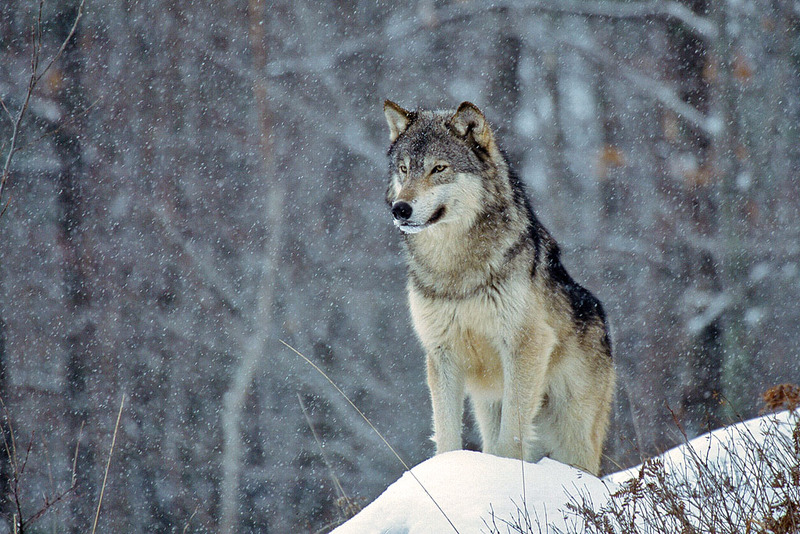 The black wolf is small in the frame and has little effect on the exposure the camera chose. The snow and light tones were balanced by the dark forest so I went with the cameras chosen exposure and it was correct. Auto exposure can become very tricky when dealing with dark subjects occupying differing amounts of the frame This can confuse the cameras metering and make it difficult to estimate the necessary exposure compensation to get a properly exposed image. Setting your camera to manual exposure and then spot metering a known tonality and properly exposing for it often works best. 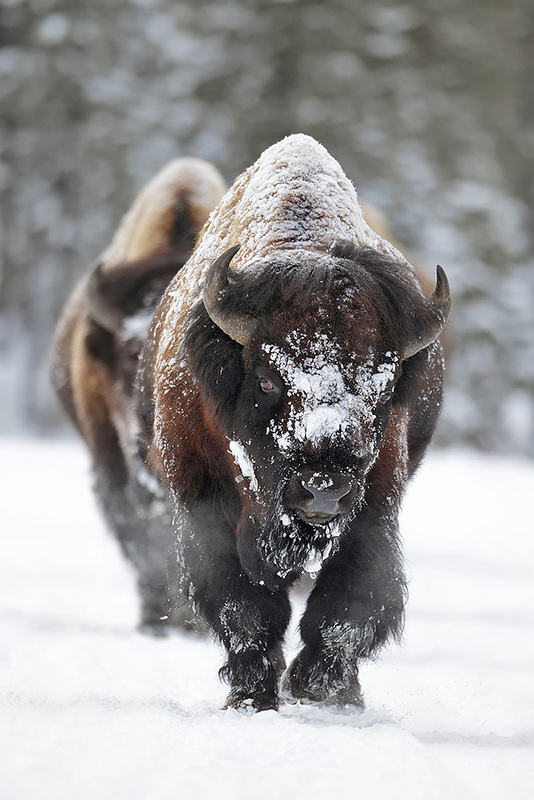 For the bison image above I metered the snow and opened up 2 full stops which rendered the snow white and fired away. The bison’s dark tone was rendered correct as well. When its snowing the autofocus of the cameras can be fooled by the falling snowflakes leading to lots of out of focus images. The heavier the snow and the larger the snow flakes the more difficult it becomes. 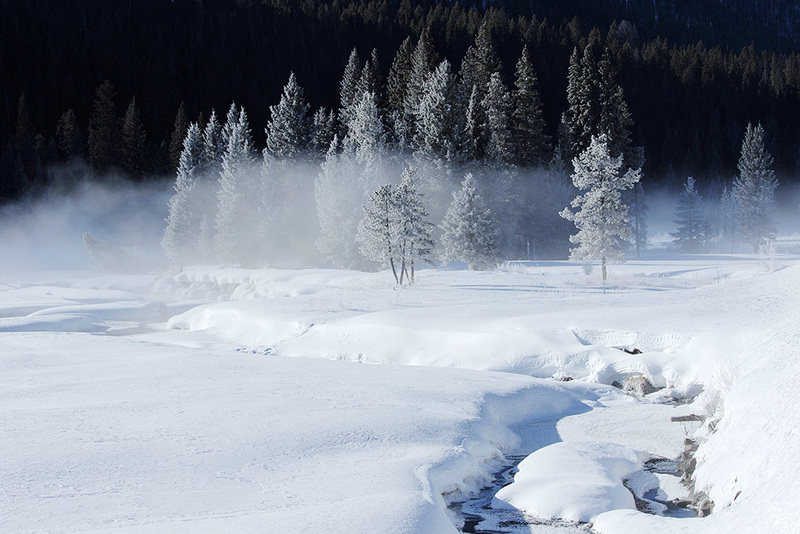 Of course this is exactly when you want to be photographing to capture dramatic winter images. There are a couple of tricks you can use to help you achieve more consistent focus in these conditions. First off use your focus limiting feature on your lens which prevents the lens from searching through it’s entire focus range. Set the lens to the minimum focus search range. I use a single focus point or even with some Canon cameras a spot focus feature. If you have that feature on your camera use it. I also set my cameras autofocus response to slow. This keeps the cameras autofocus from jumping around to much. You can set this feature in most camera systems in the menus. I also use a method of overriding the autofocus by manually focusing to assist the camera. Most high end lenses from the major camera manufacturers have this feature. This method takes practice and experience but is very effective when learned. By using the tips I outlined you should be able to photograph effectively and comfortably this winter. So get out there and have fun! Great post Dale. I definitely picked up several pointers and will be putting them to use. I need to think on the exposure tips some more, but I will get it, otherwise I will get back in touch with you. Thanks for checking it out Tim.. Be glad to help with any questions….